Karen Frazier is the author of books about metaphysics, crystal healing, energy healing, dream interpretation, and the paranormal. As a professional writer, she has ghost written a number of books and penned hundreds of articles about a variety of topics. Karen is a columnist for Paranormal Underground Magazine. She currently writes two columns for the magazine: Dreams and Symbols and Metaphysics and Energy Healing. For more than seven years, Karen was also the co-host of Paranormal Underground Radio, and she formerly served as Paranormal Underground's Managing Editor. She is also the Paranormal and Horoscopes editor for LoveToKnow, and she writes feng shui, numerology, palmistry, psychic phenomena, paranormal, divination, and tarot articles for the site as well. Karen is also a member of Spirit Healing and Resolution (SHARe), a collective of psychic mediums and energy healers dedicated to helping people dealing with afterlife experiences and hauntings, as well as offering spiritual coaching and energy healing services. A frequent guest in media discussing the results of her afterlife research, Karen has appeared on the Travel Channel's Mysteries at the Museum and the feature documentary All Around Us, spoken at regional conferences including the Oregon Ghost Conference, Haunting for Hope, Port Gamble Ghost Conference, and Paracon Seattle, and appeared on numerous radio shows. She teaches classes in energy healing, crystal healing, feng shui and space energetics, I Ching and divination, dream interpretation, Reiki, personal development, and psychic development. Karen is an intuitive energy healer who is a Usui Reiki Ryoho Master/Teacher (Shinpiden), a Crystal Reiki Master/Teacher, and a certified animal Usui Reiki Ryoho practitioner, as well as an ordained minister for the International Metaphysical Ministry. She has also extensively studied and taken professional level courses in numerous energy, alternative healing, metaphysical, and divination techniques and concepts including quantum touch, aromatherapy, sound healing, Tibetan instrument sound healing, biofield tuning, Reiki sound healing, vocal sound healing, shamanic drumming, metaphysical healing, hypnotherapy, crystal healing, shamanism, feng shui, the bagua, tarot, numerology, astrology, Jungian dream interpretation, metaphysical dream interpretation, meditation, and the I Ching (Book of Changes). She holds a Bachelor of Metaphysical Science (B.MSc) and a Masters of Metaphysical Science (M.MSc) as well as a PhD in Metaphysical Parapsychology. She is currently working a doctoral thesis focusing on sound as a source of spiritual healing in order to earn her Doctor of Divinity (DD) in Spiritual Healing. Karen on the big screen in the documentary All Around Us with psychic medium Seth Michael. Karen getting ready to perform a sound bath at Vision Collective in Portland. Photo by Tristan David Luciotti. Karen is also a musician. She studied and played music for more than 35 years including as a music major at Eastern Washington University and in various musical groups as an adult. 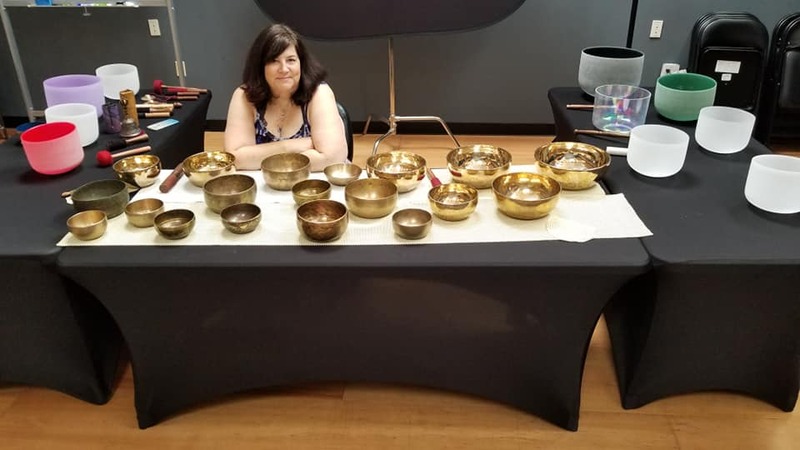 She plays flute, piano, mandolin, and percussion instruments and has developed a passion for sound healing, singing bowls, and bell metal bronze bowls and instruments from the Himalayas. Many of the bowls she plays are antiques from the 17th, 18th, and 19th centuries, and all of the Himalayan bowls have been hand made by artisans in Nepal across multiple generations. Karen volunteered as a Guardian Ad Litem for abused and neglected children, in local classrooms as a music tutor, in the phone room for the local crisis clinic, and at the (haunted) Lewis County Historical Museum. In her personal life she enjoys cooking, hiking, yoga, Nia, and making music. Karen is a member of Vision Collective, a group of healers, psychic mediums, and teachers dedicated to sharing empowering tools by offering classes and events in Portland, Oregon and the Pacific Northwest. ​Read an announcement from the Vision Collective.